2. It has been decided by the competent authority that the employees of the Directorate General (Security) shall be eligible for further retention of entitled type of General Pool Residential Accommodation on payment of normal licence fee during the period of their posting to Chakrata, or till 31.03.2022, whichever is earlier. 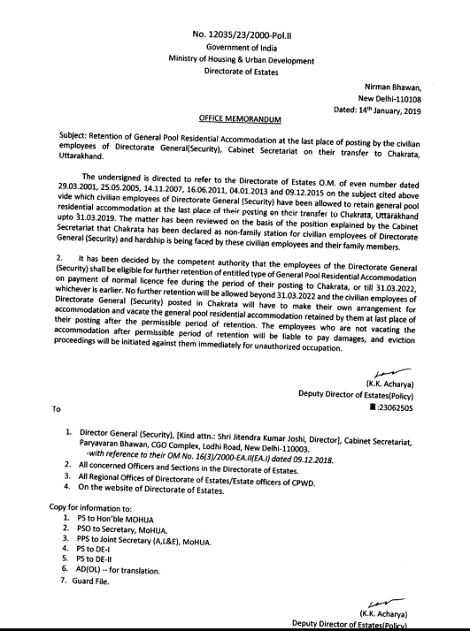 No further retention will be allowed beyond 31.03.2022 and the civilian employees of Directorate General (Security) posted in Chakrata will have to make their own arrangement for accommodation and vacate the general pool residential accommodation retained by them at last place of their posting after the permissible period of retention. The employees who are not vacating the accommodation after permissible period of retention will be liable to pay damages, and eviction proceedings will be initiated against them immediately for unauthorized occupation.